Perhaps the Bishop can help. Except fireside at ski resorts or at the rare operation that takes Irish coffee seriously, winter warmers have become an afterthought in most restaurants, taking a back seat to classic cocktails even in the chilliest climes. But last winter at New York City’s newly opened Dead Rabbit, a bar focused on comprehensive and historically accurate beverages, a new level was set for execution and breadth of drinks, with a swath of hot beverages—including a category called Bishops. At their most basic, Bishops are simply wine- or beer-based concoctions: heated, spiced, spiked and seasoned. Dead Rabbit’s co-owner and general manager Sean Muldoon was convinced after his first New York winter that, when well-constructed, these drinks will win fans. “The wine-based drinks have absolutely been a hit,” says Muldoon, noting that warm drinks on his menu made with sherry, Madeira or port sold especially well last winter. Like with all concoctions served at the Dead Rabbit, recipes have been studiously researched and sourced back to the 19th century and beyond. Muldoon and co-owner/head bartender Jack McGarry even crafted a recipe of warm beer, whiskey, apple purée, sugar, nutmeg and ginger for a drink called the Twelfth Night, based on a 17th century poem of the same name. Muldoon’s approach includes warm punches and nogs—dairy-based drinks like the Porterberry, made with Scotch whisky, rum, herbal liqueur, porter, lemon juice, ginger syrup and butter. He has an advantage with his approach in that many of the recipes work just as well when served cold, and he’s offered many throughout the summer that way. While beverages based on warm beer are currently mostly a curiosity in the United States, there’s a longstanding American tradition established by both British and Scandinavian immigrants to serve hot wine-based drinks. Today, it’s still a popular style in some regions of the country. In the winter, Toasted Oak Grill & Market in Novi, Mich., serves a handful of hot beverages, almost always including Michigan Mulled Spiced Wine made with local red wine, orange, lemon peel, turbinado sugar, cinnamon, nutmeg, ginger, cardamom pods, cloves, black tea and brandied cherries. Megan McGinness, general manager at Toasted Oak, says that while hot beverages aren’t considered as stylish as they once were, using local ingredients is useful for grabbing guests’ attention in today’s locavore environment. Wineries in Michigan routinely offer visitors mulled wine in season, she says, so the drink is something local customers anticipate each winter. In another hot drink served at Toasted Oak last winter, Coffee and Cream, locally made Zeppelin Bend Whiskey was added to coffee, along with liqueurs and Chantilly cream. Wine drinks might not be everyone’s cup of Bishop, but there are many other routes available to provide guests with something a bit more creative than coffee with whipped cream and liqueur. Eastern Standard Kitchen & Drinks in Boston, known for an extensive seasonal beverage menu, always lists a few winter warmers. Last year, they served a London Toddy (gin with vanilla, cardamom and bitters), Hot Buttered Rum (rum, house batter, nutmeg) and Anatolia Café (brandy, cherry liqueur, coffee with a touch of cinnamon). Drinks must be built hot and arrive to the guest hot, which means the system needs to work with the flow. At Eastern Standard, the barista is located next to the bar with quick access to hot water, coffee and the milk steamer. But busy hours at the 46-foot-long bar require teamwork, there and on the floor, to ensure that the drink is executed and arrives to the guest as intended. In fact, tackling operational concerns is key to a successful hot beverage program, whatever the size of the establishment. For instance, Michael King, general manager and beverage director at Washington, D.C.’s Bibiana, orchestrates the 25 drinks of Christmas each year, introducing one each day as the holiday approaches. One of the highlights is the Vin Brule, a traditional Italian holiday drink, served warm and made with cinnamon, clove, allspice and star anise. King uses an immersion circulator to keep the wine and other warm drinks he crafts at serving temperature without altering the drink through evaporation or reduction. At the Dead Rabbit, Muldoon keeps a few servings of various beverages in a warm water bath, with refrigerated backup available. “The only thing we do is the final coating of spice or nutmeg or lemon oil, otherwise it’s ready to go,” he says. “In order for us to be fast, we had to have a water bath with special containers kept at temperature.” Serving two-ounce sips gives customers a chance to sample. “This is really important if you’re trying to build the category,” Muldoon notes. Among the Bishops served in the wintertime at the Dead Rabbit in New York City is The Alymeth, with a Burgundy wine base, orange and lemon juices seasoned with spices and finished with nutmeg and orange oil. Interest in quality hot chocolate has definitely increased, bolstered by the high profile culinary twists given the old classic by the likes of Jacques Torres, master pastry chef, and the Israel-based restaurant and retail chain Max Brenner. In Los Angeles, Tortilla Republic’s chef Brandon Warren didn’t have much background in Mexican cuisine, but wanted to challenge perceptions about what was possible using the country’s basic ingredients. In terms of beverages, that meant adding twists to traditional concepts. While he serves a nonalcohol hot chocolate recipe, it’s the dark and white chocolate spiced rum versions that have caught guests’ attention. Adding house-roasted chile arbol powder to Mexican chocolate powder lends a smoky and spicy note reminiscent of a mole sauce. Finished with a torched marshmallow topping he compares to a s’more, the drink creates a striking visual. “I wanted something that crossed the border between drink and dessert, taking the drink to another level,” Warren says. Operationally, the drinks were designed to be built at pastry. Bartenders send a mug with the spiced rum portion to the kitchen, where the pre-made chocolate mix is whisked in before the mixture is run through a chinois. Filled with hot water, the mug is topped with the torched marshmallow and chile powder. Flair like that can sometimes seal the drink sale. King at Bibiana offered a Hot Chocolate mixed with cognac and topped with a housemade cardamom marshmallow last year to great success. Other operations work chocolate into classic recipes. The Tom & Jerry gets a twist at Chicago’s Sepia with the combination of Madeira, spiced chocolate, vanilla and eggs. Eastern Standard bartenders have been toying with mezcal in hot chocolate, as well as in toddies and coffees. Perhaps the most extraordinary play on hot chocolate is one that’s not hot at all. At the Kohler, Wis., American Club, the twist is serving cold chocolate. As barman Jason Van Auken at the resort’s fine-dining Immigrant Restaurant explains, “We step things up to make them more intriguing and use more intricate flavor patterns. One of the more interesting last year was cold chocolate to look like hot.” It’s made with whipped cream, Root liqueur, Godiva dark chocolate, tres leches, a highly peated Scotch whisky and sea salt. The drink is frothed, shaken with ice and topped with tres leches-infused whipped cream, cinnamon and sugar. The Immigrant tea program includes 17 different items (including one vintage offering from 1949 priced at $150 per pot), so it makes sense that Van Auken is creating a tea drink, starting with soju infused with apples, cinnamon and clove added to pumpkin butter and gingersnap liqueur, topped with Gingerbread Dream rooibos tea —a blend of ginger, vanilla and spices. There are numerous dining and drinking outlets at the American Club, and each puts a different spin on classics like Hot Buttered Rum, Van Auken says, using different spice mixes or spirits. Last winter, one recipe included butter infused with sugar, cinnamon and nutmeg, with rich dark rum and Sortilege, a whiskey made from maple syrup. Including different rums—dark, spiced, añejo—or even using bourbon is another way each of the resort’s operations crafts a signature Hot Buttered Rum. Select Legal Sea Foods units offered Hot Buttered Rums last winter, made with a dark and añejo rum, spice syrup and butter, as well as a Hot Toddy made with 10-year-old bourbon, honey and hot water. That’s the basic version, but toddies, as well as hot cider drinks, are getting reworked these days. Legal Sea Foods created a toddy variation with its Honey Apple Warmer, made with applejack, honey liqueur, spice box syrup, bitters and hot water. At Hash House A Go Go units in Chicago, Orlando and Las Vegas, a favorite is the Tuaca Toddy, made with Tuaca (a vanilla-citrus liqueur), apple cider and a cinnamon stick, topped with whipped cream and cinnamon. The current bar renaissance has freed many drink makers to experiment. Last winter, King at Bibiana came up with the Hot & Cold Gin Fizz—a cold gin, lemon and thyme mixture in the bottom of the glass topped with warmed egg white with gin and lemon, foamed. Mygrant at Raven & Rose has a personal project to create a drink using carrageenan seaweed, also known as Irish moss, a natural thickener used in Ireland to make pudding as well as a hot drink with honey and lemon juice. “I think it will naturally pair with whiskey, juices and spices. 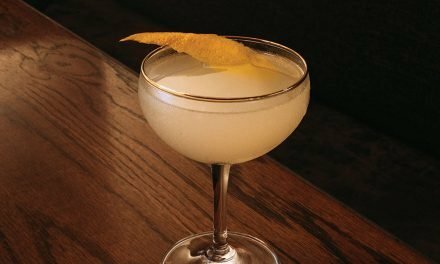 It gives a slight viscosity to a drink, something akin to gomme syrup or egg white, and the barest whisper of brine,” she says. She’s thinking in terms of a Caribbean drink that includes rum, milk, sugar, spices, and thickened with carrageenan, but this one hot. It could be that such drinks—and other inventive attempts to craft warm beverages with the same care given their cold brethren—are just around the corner at more operations.